Figure (courtesy of Dr. L Beretta) Plasma levels of osteopontin (OPN) among healthy individuals and those with chronic hepatitis C, cirrhosis and HCC from cohort 1. Box refers to the 25th and 75th percentile values, with a line indicating median levels; the interquartile range extends outside the box. Points outside the interquartile range are outliers. HCC had higher osteopontin plasma levels, compared with cirrhosis, hepatitis c, and healthy control groups (p < 0.0001). Hepatocellular carcinoma (HCC) is the most common type of liver cancer and the third most common cause of cancer-related death. Over 90% of HCC cases develop on a cirrhotic liver — which may have resulted from a chronic hepatitis B or hepatitis C infection, alcohol abuse or obesity. Early detection of HCC remains a major challenge since alpha-fetoprotein (AFP), the most widely used biomarker for HCC surveillance and detection, has limited utility for early stage disease. However, Dr. Laura Beretta and colleagues from the Public Health Sciences Division recently identified a new blood biomarker that outperforms AFP in detecting HCC and may be a major step forward in early detection. Using mass spectrometry, proteomic profiling of a small number of plasma samples initially identified the phosphoprotein osteopontin as being significantly increased in HCC compared to cirrhosis. Osteopontin has previously been associated with tumor invasion, progression or metastasis in several other cancers. Next, plasma osteopontin levels were measured in two distinct cohorts each comprised of patients with HCC, cirrhosis, chronic hepatitis C or B, and healthy controls. The first U.S.-based cohort included a majority of patients with hepatitis C and more cases of early-stage disease, while the second cohort, based in Thailand, included a majority of patients with hepatitis B and more cases of advanced disease. 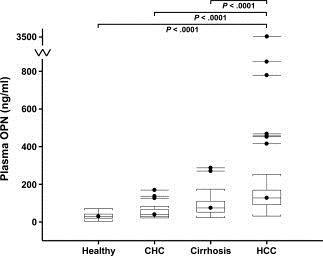 In the first cohort, mean osteopontin levels were significantly higher in HCC cases (271.4 ng/mL) than in cirrhosis (86.2 ng/mL), hepatitis C (52.6 ng/mL) or healthy controls (32 ng/mL). The predictive ability of osteopontin (Area Under the Curve (AUC)=0.76, 95% Confidence Interval (CI): 0.66-0.85) was higher than for AFP (AUC=0.71, 95% CI: 0.60-0.82), while the combination of osteopontin and AFP further improved detection accuracy (AUC= 0.82, 95% CI: 0.73-0.91). When the sample was limited to hepatitis C-associated HCC and cirrhosis, osteopontin outperformed AFP to an even greater degree (AUC=0.80, 95% CI: 0.69-0.91 vs. 0.64, 95% CI: 0.49-0.80). In the second cohort, osteopontin levels were also higher in HCC compared with all other groups, and the AUC for osteopontin alone was higher than for AFP (0.93 95% CI: 0.88-0.98 vs. 0.86, 95% CI 0.80-0.92), while the combination of both markers was better still (0.96, 95% CI: 0.92-0.99). Osteopontin also outperformed AFP when hepatitis B-associated cases were examined separately (AUC=0.97, 955CI: 0.94-1.00 vs. 0.90, 95% CI: 0.84-0.97). Finally, in a simultaneous pilot study of 22 patients from the U.S. cohort who developed HCC during follow-up, osteopontin levels were shown to be elevated at least 1 year prior to diagnosis. Thus, measurement of osteopontin may represent a valuable new opportunity towards improved screening and early detection of HCC. The results of future validation studies and long-term follow-up will be awaited with great interest.